Sometimes we reach the point of culmination in our lives, that moment when we feel like all our hopes and dreams should be achieved, and find that reality doesn’t quite meet our expectations. We have still achieved our success, but the actual details of it leave us wanting, feeling like the moment isn’t what we thought it would be. 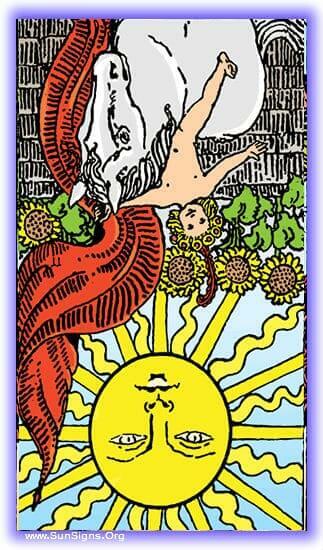 This is what the tarot meditation on the reversed sun card shows us. As you lay out the area for meditation, let yourself be overcome with that feeling of an accomplishment no one else quite recognizes, an excitement you can’t seem to share, or a feeling like you were meant for more than this meager success. As you open your eyes in your meditation, you find yourself in a lab, examining samples. You put in years of school for this, passed grueling tests. You spent hours agonizing over your resume, desperately wanting to make sure you got into that dream job in this lab. It was where you wanted to work, and on the outside it all seemed so exciting! Testing samples, finding diseases, working with some of the most brilliant minds in the industry finding cures! That was all you could think about! Making that discovery that saved thousands of lives! It would have been so glamorous to be recognized for that. Somewhere along the way, you forgot that this also meant processing thousands of samples comparing instances of the disease. You forgot that long before the glory can be reached, there would be dozens of lab techs and scientists going over the same data a hundred times trying to find inconsistencies. And most of all you forgot that you wouldn’t be the one in the lime-light when the discovery was made. After all, you were processing the results of other people’s research, not doing your own. You had the training to be doing that research, but not yet the experience or certification to have the respect of your peers to attempt it. In short? You forgot the work, that the path to success is a long one, and sometimes contains multiple steps. Where you are now is a great place to be though! You’re at the beginning of a new journey, a new success story. This isn’t the success you wanted, but you are working in the field you wanted to work in, doing the work you wanted to do, and that’s more than a lot of people can say! Focus on this concept, the successes of your journey, rather than the let-downs, as you think about the future ahead and where you’re going. You’ve made a long journey, you’ve reached a level of success, even if it isn’t the one you hoped for, and more successes lay ahead! Record your vision of the future, what you hope for, and how you feel about the successes of the character in the meditation. And remember, every success is worth celebrating, and may just be a stepping stone.